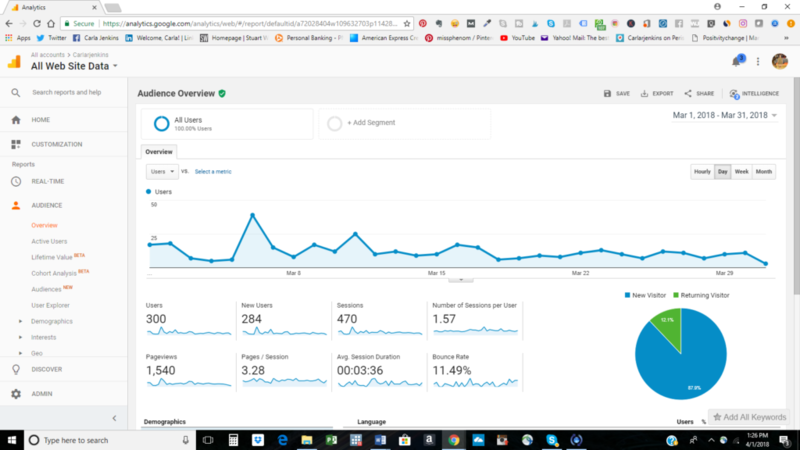 Carlarjenkins.com March 2018 Google Analytics Is The Site’s Best Month Ever! www.carlarjenkins.com has 1500+ monthly pageviews and 11.49% bounce rate! I have a very big announcement: my March 2018 www.carlarjenkins.com are through the roof! I have achieved over 1500 pageviews this month and a very low 11.49% bounce rate. I would like to thank all of my readers for sticking with me and enjoying my content. I have videos accompanying these articles. Video is the biggest converter. Also people consume content differently. Some people like reading while others like watching videos. carlarjenkins.com has both. These are reflected in the 1500+ pageviews. You will get there! Thanks for commenting and having me at the Bloggers Pit Stop.